PULLMAN, Wash. – A Washington State University animal-lover and researcher is being recognized for her expertise on how humans and animals interact. 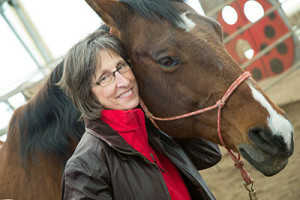 Phyllis Erdman (http://education.wsu.edu/directory/faculty/erdmanp), an executive associate dean in the College of Education, has been named as the Human-Animal Interaction Section chairperson of the American Psychological Association. Erdman has been involved in human-animal interaction (HAI) since her doctoral work in the 1990s and was first introduced to pet therapy dogs in a San Antonio elementary school. At WSU she has become involved in an equine program with researchers in the College of Veterinary Medicine, specifically Sue Jacobson. Erdman’s work has included PATH to Success, beginning in 2008, (http://www. /index.aspx) and, beginning this year, a horsemanship program for military veterans. As chair, Erdman will be vital to organizing annual APA section activities as well as facilitating communication among group leadership. One focus will be to educate people about the differences between comfort animals, service animals and therapy animals. Most important, she said, is bringing more legitimacy to HAI by documenting its effectiveness with evidence-based research and finding ways for graduate students to do HAI research. The section is also working on ways to provide continuing education units for clinicians and researchers.